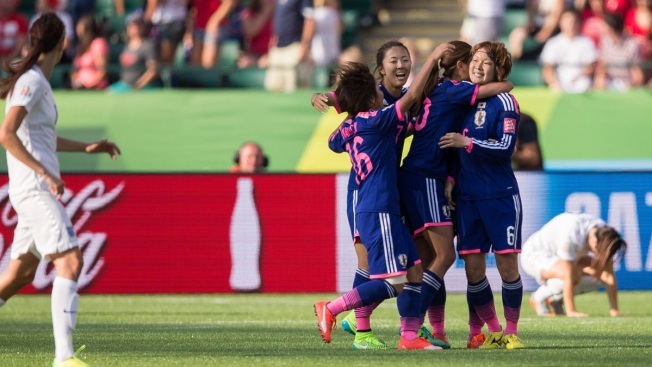 Japan's players celebrate after England scored an own-goal late in the game to give Japan a 2-1 victory in their FIFA Women's World Cup semi-final match at Commonwealth Stadium in Edmonton, Canada on July 1, 2015. Perhaps, Australia coach Alen Stajcic was on to something when he said, "We're not the Netherlands," in responding to question regarding how the Matildas might defend against Japan in the quarterfinals. Familiar with their Asian rivals, Stajcic said the key was pressuring Japan's ball carriers and clogging up the middle so they couldn't generate chances off their crisp-passing attack. 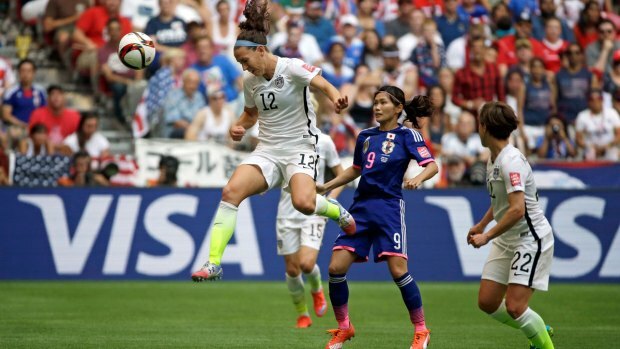 That was unlike the Netherlands, which allowed Japan to create in the offensive zone in a 2-1 loss in the Round of 16. The Lionesses directed 15 shots on net, while limiting Japan to just seven. And England carried much of the play in the second half, particularly during a four-minute stretch in which they generated three scoring chances. They included Toni Duggan's shot off the crossbar. Japan coach Norio Sasaki referred to England's style as "simple," but noted it did hamper his team's ability to move the ball. Now the United States and coach Jill Ellis gets the task of defending against Japan, which has won all of its matches in Canada. The final is scheduled for Sunday at Vancouver's BC Place. FINDERS, KEEPERS: After giving each of his three goalkeepers a start in the preliminary round, Sasaki has stuck with Ayumi Kaihori in the knockout stage. And that was despite Kaihori misplaying an easy shot that allowed the Netherlands to cut Japan's lead to 2-1 in second-half stoppage time. Ever since, Kaihori has allowed just one goal — Fara Williams' penalty kick against England — in two games. Against England, she also made a diving save to her right to bat away Ellen White's shot from inside the penalty area to keep the score tied 1-1 in the second half. Overall, she's allowed three goals and made seven saves. LAST CHANCE: This is the last World Cup for three of the game's best-ever players. German goalkeeper Nadine Angerer is retiring following this World Cup, as is U.S. forward Abby Wambach and Japan's Homare Sawa. Germany faces England in the third-place match on Saturday in Edmonton, while the United States plays Japan in the final Sunday at Vancouver's BC Place. Sawa has had limited playing time in Canada, four years after playing a lead role in Japan winning the 2011 title in Germany. Sawa, the 2011 FIFA women's player of the year and 2011 World Cup player of the tournament, did not play against England. Wambach, 35, is the all-time international leading goal scorer, male or female. The 2012 FIFA player of the year has seen her role change with the U.S. team, but has all along maintained that she's willing to do whatever it takes. During this World Cup she's started three matches, and come in off the bench for three. Fans of the United States have followed their team throughout the World Cup, and Vancouver's proximity to the border means that the final against Japan will likely bring a big, pro-American crowd. The Americans' group-stage finale at BC Place last month brought in 52,193 fans.